FAIRFIELD, Calif. — Jelly Belly Candy Co. has extended the Krispy Kreme Doughnuts jelly bean collection with an 8.75-ounce pouch bag, available now, and a 1-ounce tin, coming in September. The tin’s petite size lends to its gift potential. The lid is inspired by Krispy Kreme’s chocolate doughnut iced with sprinkles and embossed with an array of sprinkles. The doughnut hole window invites a peek at the jelly beans inside featuring flavors inspired by Krispy Kreme doughnuts: Original Glazed, chocolate iced with sprinkles, cinnamon apple filled, glazed blueberry cake, and strawberry iced. The pouch bag is made for snacking and sharing. 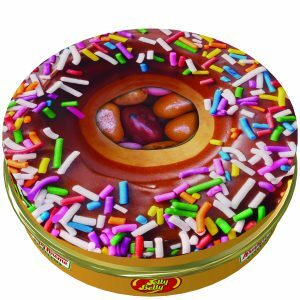 Adorned with Krispy Kreme’s branding and signature Jelly Belly logo, its reclosable seal keeps remaining jelly beans fresh.